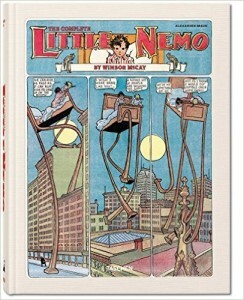 Winsor McCay: The Complete Little Nemo by Alexander Braun tells the story of Little Nemo, who is one of the greatest dream voyagers of the 20th century. The volume contains the adventures and stories of the restless sleeper Nemo as he embarks to Slumberland, where he enters a realm full of colorful companions that will accompany him in his psychedelic and thrilling experiences. The book comes in full color and large format that completely reveals the details of the panels and pages of the comic. In addition, the colors that complement the wonderful illustrations are quire exquisite. The book is also has its own cardboard suitcase equipped with a handle for easy handling. Aside from the Little Nemo comics, there are bonus features about the artist and Little Nemo which the readers may find interesting. The large size of the book may prove to be disappointing for some readers. For the more meticulous ones, they may look for something more satisfactory to their taste when it comes to the colors of the book. Alexander Braun finished art history in Bochum and Berlin. Over the years, he has accumulated an extensive collection on the history of comics. He also served as a curator on various museum exhibits including the works of Winsor McCay.